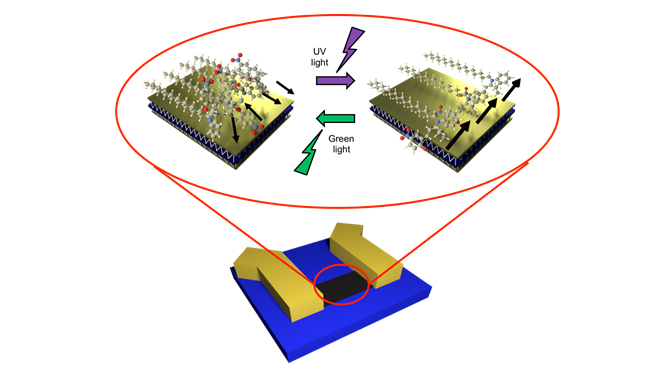 Researchers from the University of Strasbourg & CNRS (France), in collaboration with the University of Mons (Belgium), the Humboldt University of Berlin (Germany), and the University of Trento (Italy), have created photoswitchable molecular lattices on two-dimensional materials and exploited them to fabricate high-performance hybrid devices with light-controllable electrical outputs. Their results have been published in Nature Communications. This novel and versatile approach takes supramolecular electronics to the next level by achieving full control over the architecture vs. function relationship in molecularly engineered 2D materials. These findings are of great importance for the realization of high-performance multifunctional hybrid devices under control of nature’s most abundant and powerful source of energy – light.